Carla Hall for the win! For the Butternut Squash Fritters: Peel the squash, cut in half and scoop out the seeds. Using the large holes on a box grater, grate the butternut squash. Wrap the squash in a clean kitchen towel and, over a large bowl, wring as much liquid out as possible. Discard the liquid. In a medium bowl, toss the squash with the flour, baking powder, chili flakes, salt and pepper. Stir in the scallions, pumpkin seeds, garlic and parsley. In a separate bowl, combine the eggs and milk. Add the wet mixture to the squash mixture. Gently combine. Heat oil in a frying pan over medium-high heat. and add a heaping tablespoon of fritter batter. Press down gently with a spatula and repeat until pan is full. Cook for 1 to 2 minutes on each side or until golden brown and cooked through. Remove from pan onto a rack and sprinkle lightly with salt. Continue until all the batter is cooked. Garnish with cilantro and serve with curry yogurt sauce. For the Curry Yogurt Sauce: In a small skillet, over low heat, add olive oil and heat through. Add the curry powder, and cook for 1 minute allowing the curry powder to bloom. In a small bowl, stir together the curry mixture, yogurt, lime zest, lime juice, salt and pepper. 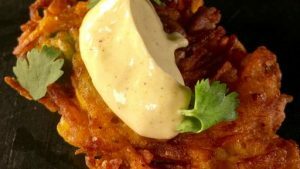 Serve fritters warm with the curry yogurt sauce. Tip: Not curious about curry? Stir your favorite spice blend into the yogurt mixture to make it your own!